The ACQ32CPCI is a 6U CompactPCI™ intelligent data acquisition board providing 32 channels of simultaneous Analog Input at 250 kHz and 2 Channels of 1 MHz simultaneous waveform capable Analog Outputs, both offering 16 bit resolution. The board also includes 8 general purpose Digital I/Os which can also operate as a digital waveform generator. The board offers excellent AC characteristics with onboard calibration for DC accuracy. The ACQ32CPCI is an Intel StrongARM™ based board with up to 128 MBytes of onboard sample storage offering deep transient recording capability. The board offers pre and post trigger capture modes either from a digital trigger or from an analog level trigger from any of the analog inputs. 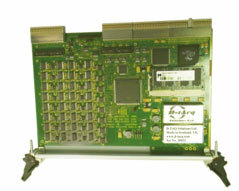 The board also offers a Master DMA mode for low latency data acquisition directly into host memory. The board accepts up to 6 front panel, rear panel or PXI™ compliant digital inputs for clocks and triggers. The 6 digital inputs can be used to operate the analog inputs and outputs either synchronously or independently. Support for Signal termination / Signal Conditioning is available from either Mezzanine based Front Panel boards or Transition Module based Rear Panel boards.